On our continuing Open Education from Around the world trail Cengiz Hakan Aydin is leading us out of Europe with his post on Turkey. The Republic of Turkey is located at the crossroads of Europe and Asia making it a country of significant geostrategic importance! It is famous for both historical reasons (the Ottoman Empire, palaces, sultans) and for edible pleasures (Turkish delight, baklava and coffee)! 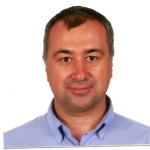 Cengiz Hakan Aydin, PhD, is currently serving as the Dean in the Faculty of Economics (open and distance learning institution) of Anadolu University, Turkey. He teaches undergraduate and graduate courses, such as Instructional Design, Designing Open and Distance Learning, and Trends in ODL. His research interest focuses on design and development of open and distance learning environments, social aspects of online learning, technology integration into learning environments, evaluation of technology interventions, e-learning in workplaces, adult learning, and educational communications. He served as the President of the International Division of the Association for Educational Communications and Technology (AECT), as one of the board member of the International Council for Educational Media (ICEM) and of the International Division of AECT. Professor Aydin has been a member of editorial boards of the journals, the International Review of Research in Open and Distance Learning (IRRODL), and Educational Media International (EMI). He is currently serving as a member of the steering committee of OpenupEd, a MOOC platform based in Europe. You can contact him using chaydin@anadolu.edu.tr or on Twitter uisng @chaydin. 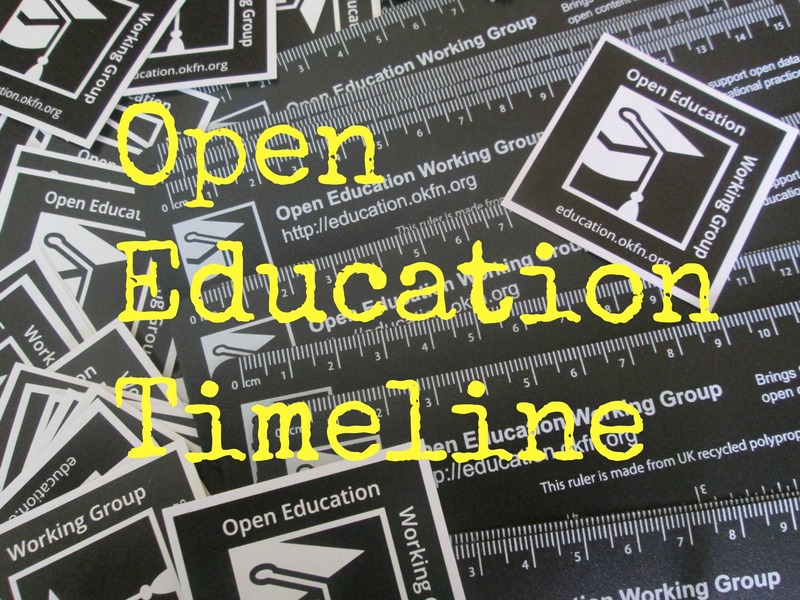 Many have agreed that the Open Education Resources (OER) movement is a consequence of the Open Education trend started with the establishment of Open University of UK in late 1960s. Since then, a number of open universities in various countries have been built and provided learning and/or earning a degree opportunity to those non-conventional learners. Due to the increasing the need for more open and flexible education opportunities as well as boosting number of non-conventional learners, and some other developments, opening up education through information and communication technologies has become one of the major trends in Higher Education. It is worth noting the success in open courseware (OCW) movement, initiated first by Massachusetts Institute of Technology (MIT) in 2002, fostered the OER initiatives and grasped the attention of major international institutions, such as UNESCO. Later, the Massive Open Online Courses (MOOCs) contributed the popularity of OER movement. 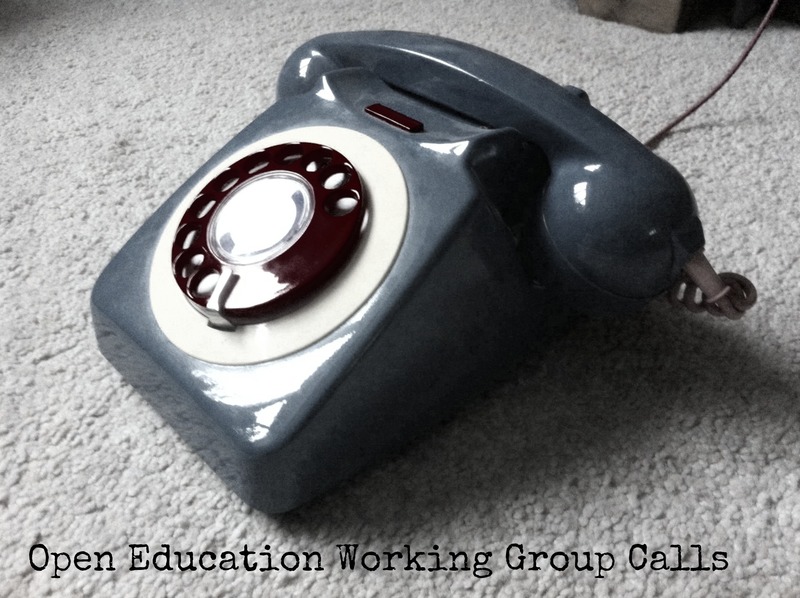 Open Education has a long history in Turkey, rooting back to 1930s. However, the most sustainable Open Education initiative is the establishment of the open Higher Education programs of Anadolu University. The university first launched two four-years long undergraduate programs in 1983 and since then have been providing open and distance learning opportunities to millions of those unconventional as well as conventional students via its distance degree and certificate programs, MOOCs and OER. Anadolu University is currently serving 1.4 million active students via 17 bachelors, 34 two-years long associate degree (www.anadolu.edu.tr/acikogretim/turkiye-programlari) and 26 certificate programs (esertifika.anadolu.edu.tr), and 65 MOOCs (akadema.anadolu.edu.tr). Anadolu University is also supporting and participating Europe based open education projects, such as OpenEducationEuropa project (www.openeducationeuropa.eu/en/) initiative of the European Union, HOME (home.eadtu.eu) and OpenupEd (www.openuped.eu), a project of the European Association of Distance Teaching Universities (EADTU). 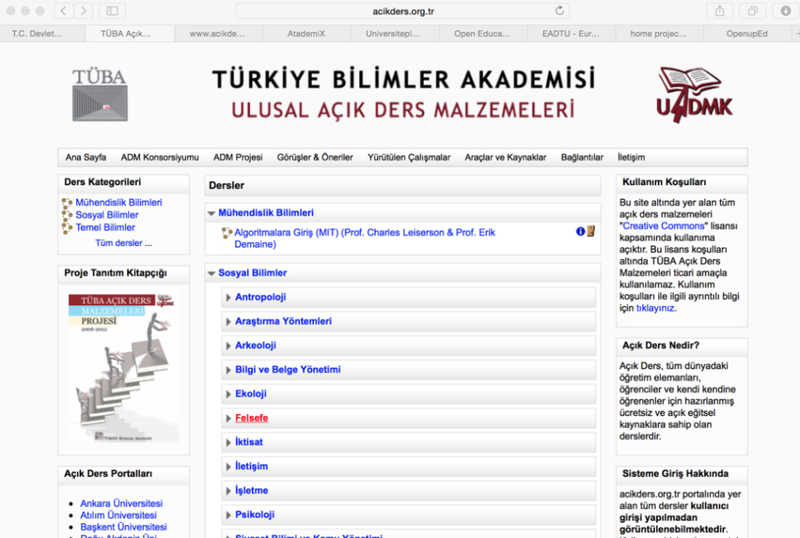 Another OER project, inspired by MIT’s one, is the Turkish Open Courseware project. The project initiated in 2006 by the Turkish Academy of Sciences (TUBA), a semi-governmental institution. TUBA intended to bring together the major Higher Education institutions in Turkey to open up some of their courses. A working group built and some funds acquired from the State Personal Development Agency. During 2007-2012, course materials belong to 85 courses in varying fields developed and still open to the public. According to recent figures up to May 2015, approximately 1.2 million individual users accessed these course materials. More information can be found here (www.acikders.org.tr). Meanwhile Anadolu University decided to open up its course materials designed and developed for its distance students to all via a new platform, entitled as YunusEmre. More than 2.5 million of users accessed the course materials related to 167 courses between 2007-2013. 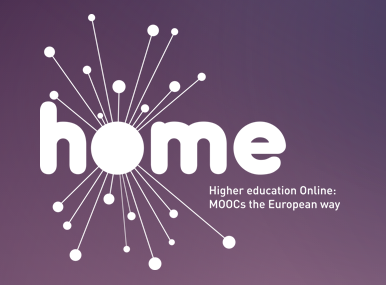 In Turkey, the MOOCs movement has shown its impact a bit later then rest of the world. 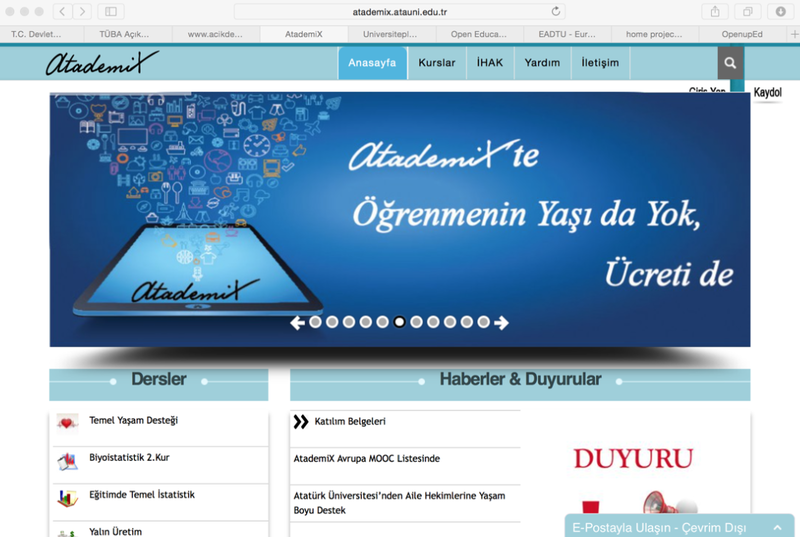 Although several individual attempts launched before, major initiatives, Anadolu University’s AKADEMA (akadema.anadolu.edu.tr) and Atatürk University’s ATADEMIX (atademix.atauni.edu.tr), were introduced in November 2014. However, the courses started in early 2015. Currently there are 65 courses offered in Akadema and 13 courses offered in Atademix. Akadema uses a customl developed platform while Atademix uses a version of Moodle. Anadolu University mainly transferred its distance course materials into MOOCs in Akadema and according to recent numbers approximately 2000 people completed these courses. This is almost 4 percent of the registered users. Meanwhile all of these courses in Akadema and Atademix are in Turkish, and several courses in Turkish can also be found in Coursera. 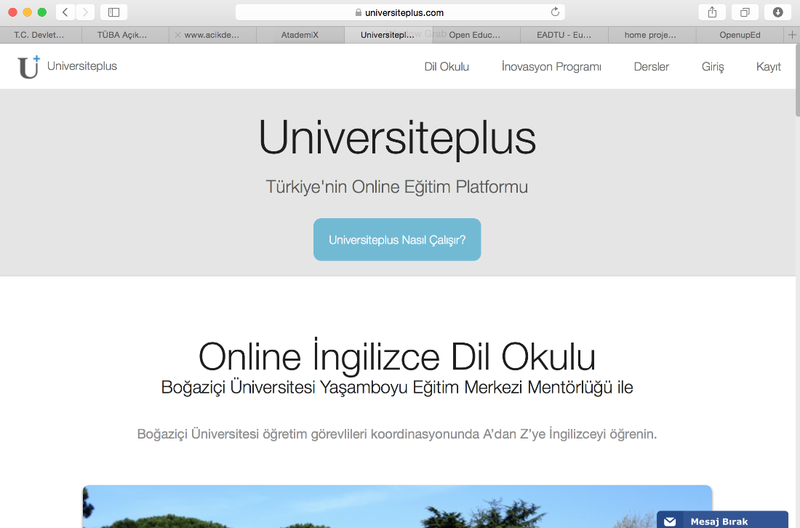 Additionally, couple entrepreneurs intended to create a Coursera like environment in Turkey, entitled as UniversitePlus (www.universiteplus.com). Currently they offer 32 courses from different universities. Although Open Education has a long history in Turkey, only a few initiatives have been effective, efficient, engaging and enduring. 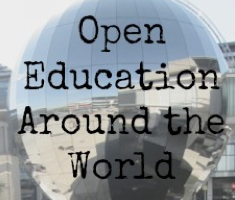 The major barriers of the development of Open Education in Turkey are similar to the ones in other countries. Lack of awareness and support from government and other decision makers, shortage of expertise in design and delivery of online courses, cost of technology and expertise, professors’ resistance can be listed as the major barriers.